Welcome to Activity 7 of Google CS First games. 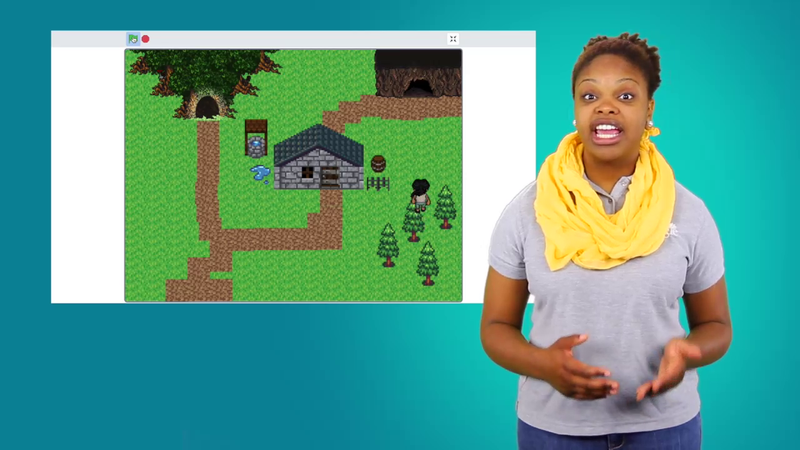 In this activity you'll learn how to use storytelling and video game design while you build a role-playing game or RPG. This activity will also introduce a few new events. An event is something that tells code to run. In previous activities you may have used a key press event to run code that moved a sprite. You may have also used a when flag clicked event to run code at the start of your program. This activity uses an event called Broadcast. Broadcast is a special type of event. A broadcast block that sends a message, and a when I receive block that receives that message, and runs code when it does. Broadcast is useful in video game design, because it helps you to synchronize, or to make many actions happen at the same time in a program. For instance, if a character were to fall off a cliff, you could broadcast a message called Fall. Then, you could create code that would run when that message is broadcast. Maybe the score goes to zero. The timer stops, the sound plays, and the Game Over text appears. Role playing games often take place in multiple locations. In this activity you'll use Broadcast to control when sprite's show and hide in each location. This game has a sprite the user controls with the keyboard. You'll build a story for your RPG game, based on this sprite searching for something through several locations. To get started, choose a starter project next to this video. Each starter project has a different main character sprite. Then, sign in using the information from your Club Passport. This starter project already contains a few items you'll use to create your game. It has a character sprite, which is programmed to move and change costumes if an arrow key is pressed. The project also has three entrance sprites, which in later videos you'll program to change the backdrop if the sprite touches them. Finally, it includes an object sprite, which will be the basis for the plot for your RPG. The player's sprite will need to find this object in one of the locations. Once you've selected a starter project, remixed it and signed in, and chosen one sprite as the main character, click the green arrow to move on to the next video. That's where you'll start customizing and designing your RPG.